MDC Alliance leader Nelson Chamisa, who lost in the July 30 presidential elections to President Emmerson Mnangagwa, rejected the results, claiming that the polls had been stolen. He approached the Constitutional Court with the view of overturning his rival's victory, but without success. The case attracted international attention after it was broadcast live on television, giving Zimbabweans a front row seat in court, some for their very first time. The case collapsed after judges insisted that only primary evidence, which included opening the ballot boxes, would have provided sufficient evidence to prove the alleged results tampering and vote-rigging claims. 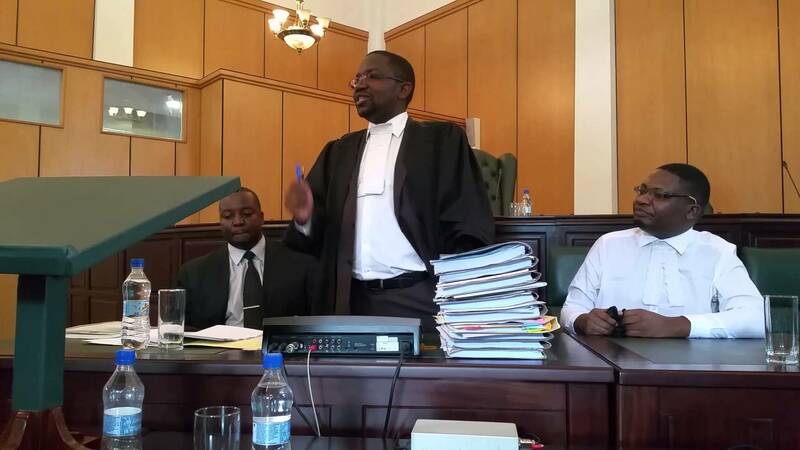 Chamisa's lead lawyer Advocate Thabani Mpofu (TM) differed with the learned judges, and recently spoke to our reporter, Blessed Mhlanga (ND), on the "fulcrum and pith" of the matter that his team brought before the courts. ND: You were the lead lawyer in the case, which was eventually dismissed with costs because you had no evidence to show rigging. Why didn't you seek the residue? TM: The residue was bitterly poisoned. A lot of things had happened after the poll, most of them well-documented. The intention was to conceal the theft, but it was clumsily prosecuted. We placed evidence of such interference before the court and all reasonably informed Zimbabweans know about the efforts to interfere with the ballot boxes. You could not expect fresh water to spring from a salty well. Both the Zimbabwe Electoral Commission (Zec) and Zanu PF had tampered with the ballot boxes. People had been raped and sodomised to achieve that goal and sadly still, nobody says anything about that. Further, once the Registrar refused to issue our subpoena, we decided that we were to concentrate on showing that Mnangagwa had not won the elections and in showing that he had not won the election, we had to concentrate on Zec's own numbers. Never mind that you cannot practically get the residue within seven days and our courts have effectively held as much, we had so many numbers to deal with, but the incontestable one was the difference between the presidential and parliamentary elections, which was 40 717 and the numbers that we had to knock off was just over 31 000 to force a run-off, so once we established that and there has been no answer to those discrepancies, that was sufficient in my view. How could it not be? Zec had changed its results three times over! I must also point out in dispelling doubt and answering all scruple, that the exchanges that I had with the Chief Justice (Luke Malaba) were not about the V11s, it was about the residue, and the residue in the context of the exchange is what is found in the ballot boxes. The V11s that we managed to gather were before the court. There was a CD with such V11s and the information thereon had been used by the expert in compiling his report which Zec agreed with to a material extent. ND: Is that what you were referring to as the poisoned chalice? TM: Exactly, we knew that the ballot box had been tampered with, we knew there had been vote stuffing and ballot swapping. You have seen the videos. We placed them before the court. It's a pity our request to use an overhead projector was not met with a favourable response. ND: How difficult was it for you to prepare for this case? TM: I know some will not believe me when I say this, but this was actually an easy case. Of course, it warranted a lot of involvement and attention, but this was an easy case. The moment the Registrar refused to issue our subpoena, we simply said that we would only show that ED had not won and establish that with reference to Zec's own figures. There was nothing difficult at all, but you know such a case comes with its own stress and all, but it's nothing that I am not used to. It was actually a very simple case to take. How could it not be simple when Zec had changed its results three times, accepted that there were errors and totally failed to account for the discrepancy between the presidential and parliamentary tally? ND: Why did you choose to take on this case? TM: I don't choose cases, I just take cases. I am bound in duty and conscience to do so. Here is the thing: I genuinely believe that there was an impropriety, I genuinely believe that the will of the people was subverted and I genuinely believe that Zimbabweans required someone who could state their cause without fear or favour. In such circumstances; people must see a rare instance of disinterested patriotism and heroism on show. ND: Looking at the judgment that came, did this break your spirit? TM: No, my spirit is unbreakable, it is completely and utterly unbreakable, if you want to waste time, try to break it. ND: It looked like in the judgment everything was against you. As a lawyer, do you believe that you did your best to make sure that this case brought the best result for your client? TM: We did our absolute best, without a doubt! I go around, people talk to me, they call me, send me messages, they congratulate me, they heard our arguments and understood them. So if I managed to get through to lay people, that's the end. The business is resolved. A lot will, however, unravel and our efforts will not go to waste. ND: As a lawyer, do you think that there is still need to look at the law, particularly the Electoral Act, the way that people challenge so that we can be able to get residue and still challenge the election results within seven days? TM: No, you don't actually need the residue in a rigged election, you need the kind of case that we put across. Look, if people say they can still not see that there is a difference between presidential and parliamentary figures, if people say they cannot see that Zec changed its results three times over, if people still say they cannot see that we do not know what Mnangagwa's final tally was, then the situation is irredeemable. I, however, do not think that there is a problem with the Electoral Act. Within the seven days you can put together a case (and) you can show that Zec announced that 105 000 people had voted in Mash Central by 5:30pm and yet at the end of the day, it says a total of 444 000 people had voted in that constituency. In my view, this calls for an explanation, you can show that at seven o'clock, Zec announced that there had been a 60% voter turnout in Masvingo by 6pm, yet when the results were announced, there was suddenly 84,6% voter turnout. You can show within seven days that results came from ghost polling stations, that all the mistakes made by Zec favoured one person, indeed, that the final result relied upon by Zec was never verified. Look, that doesn't call for any changes to the law, you can establish that with ease as my kids would say 'easy peasy lemon squeezy'. ND: Some have argued that you don't need a judge at the helm of Zec because you have a judge running the elections and if you have a dispute you have to go to another judge to deal with the dispute. Does this resonate with you? TM: It does kind of resonate with me although I do not think that the High Court judge was able to influence the judgment of the Chief Justice, but it's a valid point. You want those independent commissions to be totally independent. The impression must be given that Zec is absolutely transparent and that it is in no way afflicted by any trace of bias or suspicion. It should be above that. That said, I must emphasise that this does not, in any way, affect the outcome of the court case. ND: Are you going to be part of the team that is going to take this case to the African Commission on Human and People's Rights? TM: Yes, I am part of the team. ND: What is your strategy, (and) what do you think you will achieve by going there? TM: You will see our results very soon, don't worry about that. You cannot rob people who have committed their cause to God and succeed. I defy Zec. ND: I wanted to understand your client's motive in taking it there, what could be the reason? TM: We must give room to all forms of dispute resolution mechanisms. If the quest for justice has not been satisfied, the process must be pursued even though the heavens fall. We believe there is something that must be sorted out and we will not rest until the right side is put up again. I confess, I can neither feel the force nor morality of any argument to the contrary. ND: Can you explain your somersault, you were a "junta lawyer" so to speak when you were in court talking about the legitimacy of the coup and how former President Robert Mugabe lawfully left office and all of a sudden, you are now against the same people, saying they stole an election? TM: I was not the "junta's lawyer" and it is not a somersault, I represented whoever I represented at that stage and that's it, I am proud of what I did. You see I am an Advocate, an Advocate is a taxi driver; he will pilot a prostitute and immediately thereafter pilot a bishop. So it's not an issue both professionally and morally. But I must say ultimately there is one constant, I have been on the side of the people. ND: You work alongside Nelson Chamisa, who is the president of the MDC Alliance and who was your client in this case. Did you take this because of this work relationship that you had and maybe did you have any promise of a prominent position in the government, had you won the case? TM: Let me dispel that notion. Number one, I am not a politician and I am not going to take political office. I'm neither suited nor made for that kind of work. Number two, I am a lawyer and after my sojourn as a lawyer, the next thing that I can become is a judge, but then I am still too young to be a judge by our laws, so I can't be a judge now, so there is nothing that is promisable to me. You can't make that kind of promise to me and Chamisa knows better. He never made me any promise, he would never dare. So I did this out of conviction, I did it in defence of the least of my brethren, I did this because I am a lawyer and that is what must happen. I hope Zimbabweans will eventually stop picking and choosing clients for me. ND: There has been talk that after this case, you were smiling all the way to the bank after pocketing over $500 000, was it in cash or transfer? TM: That's ungodly nonsense peddled by sub-humans who are capable of any species of iniquity. I have not taken any cent and am not going to take anything out of this. I acted pro bono and out of conviction and those who know me, know that when I am doing something pro bono, I do it out of conviction. I fight as if I have been promised the whole world. But what I can assure you is that I have not and will not take a cent out of this. Far be it from me that I should sin against people's dreams by protecting them for hire. ND: Is this for the whole team or for you only? TM: I can't speak for everyone, but what I know is that nobody charged, nobody was paid and there are no plans to charge or to pay anyone. ND: Zanu PF said its legal fees which have to be paid by your client is somewhere close to $3 million, does this make sense legally to you? TM: That's nonsense. Pity the delinquent. I am surprised that people actually invest time in such nonsense. ND: Going forward, is this the ceiling for you because this is one of the biggest cases that you have probably taken. What are the sights besides becoming a judge? ND: Lest I be misquoted, I haven't said that I want to be a judge, I said the only thing I can become is a judge and I said that in the context of answering the question you posed on whether I had been promised anything. I am not saying I am throwing my hat into the ring and that I want to be a judge. No, no, no! Look it's a big case and maybe after all things have been considered it will be the biggest, but then you never know what's coming next; there might be bigger cases, who knows. All I can tell you is that for now, I'm going back to my practice to serve the people and to ensure that the laws meet their legitimate demands and aspirations. ND: You spoke of intimidation when you were doing this case, are you still looking at your shadow as you are walking? TM: I still look at my shadow, but the intimidation has subsided. There is, however, no fear in my blood. ND: Do you have regrets on the manner you handled this case, how you tabled evidence or other things? TM: I absolutely have none, we did all we could to establish our case. We had an unco-operative and hostile system to contend with. You know what the sheriff did on instructions, you know the complaint that we had against the Registrar refusing to accept process. If you want to issue a subpoena, nobody should ask you why you are issuing the subpoena. It just should be issued. It is for the person who has been subpoenaed to then object when they come before a court, but the subpoena must be issued. We cannot have a system which says to a litigant you can't issue legal process, I think that is completely unacceptable, much the same way you cannot have a system which allows a sheriff duly instructed to fail to serve process only for him to tell you that he was ordered not to do so. He has eight hours within which to effect service, and he completely refuses; it's totally objectionable and beyond our dignity as the legal profession. So that is the kind of system that we had to come up against not only did we do our best, but people who watched, people who listened to us were absolutely satisfied and the love we have received from the people is tremendous. I'm absolutely delighted with the manner we prosecuted this case. ND: Talking about people who watched you, what do you think about the aspect that this court case was actually televised live? TM: It is of vital importance. It is a big step in our democracy and strengthens its fibre. Right now, we have people making their own conclusions on the case and arriving at their own conclusions on the judgment of the court. Their judgment is as important as the court judgment. So ultimately, people are able to review the judicial processes, they are able to throw in their views. That is extremely important and this is something that must continue. ND: Since you raised the issue of people's views on the court judgment, Zanu PF legal secretary Munyaradzi Paul Mangwana was saying the statement that you made after the court ruling was contemptuous. What's your response? TM: First, that's Munyaradzi Paul Mangwana and he has exposed himself to public execration as a result of his implacable malice. Second, you can see that the comments have hit home and that's why Mangwana and those he represents are scared. But I have never disrespected the court. That court is manned by individuals I have high regard for, even at a personal level. They know that my respect for them is full and unmitigated, much as they know that I will never lie to them. I will never say I agree when I disagree. I have, for reasons that I stated, chosen to disagree. I know the law and I fully submit to its restraint.